It took 80 years for Belmont’s Yvonne Williams to make her first foray into the world of children’s writing, following a poem for her grandchildren. “I never had any intention to write at all until I wrote a poem about their and my cats,” she told the Indy. Yvonne published her book, The Tales of Cleo and Oscar, just in time for her birthday in August, under the penname Nanna Von. “That’s what the grandchildren call me,” she explained. A former opera singer and conductor of the Geelong branch of Australian Youth Choir, Yvonne began writing poetry in her late seventies. Her feline verse caught the eye of friends, who encouraged her to keep writing. Cleo and Oscar sprang from the poem into her book, travelling from Geelong to Queensland, meeting elephants and wicked fairies, and riding in kangaroo pouches. “The cats get up to lots of mischief,” Yvonne said. Yvonne teamed with Geelong painter John Hughson to bring Cleo and Oscar to life. “He’s absolutely wonderful – he could draw or paint anything,” she said. Originally Yvonne had planned for her eldest granddaughter to illustrate the book but, sadly, she died of diabetes-related causes at age 22. “She was a very talented artist – I absolutely adored her,” she said. Yvonne said the “three years of damn hard work” writing the book “was the most difficult and lonely task I’ve ever taken on“. Her writer friends gave her “honest” and “valuable” feedback that discouraged her at first, she said. “When the proof came back I looked at all the black marks … I didn’t want to pick it up for a week,” she said. A UK publisher showed interest in the draft but told Yvonne she had to pay $6000 to publish, so she decided to self-publish instead, she said. 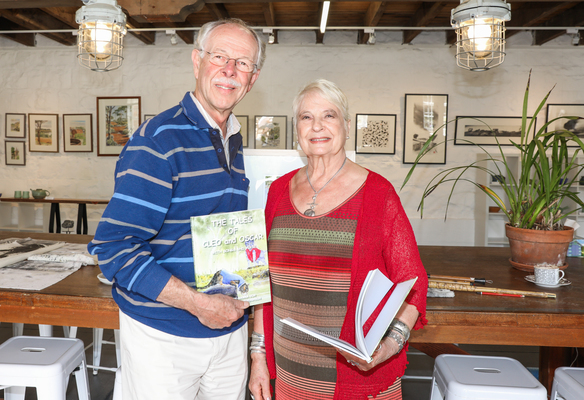 The Geelong resident of 42 years had sold almost 200 copies since August and was about to publish another 100 more, she said. Recently a woman told Yvonne that her granddaughter loved the book and wanted to frame the front cover, she said.